Researchers and collectors will, at first glance, welcome this attractive and apparently "complete" collection of images and texts of prints in the Tōkyō nichinichi shinbun (TNS) and Yūbin hōchi shinbun (YHS) news nishikie series. Its beauty, though, is only skin deep. As they try to make sense of the book's organization, collectors and researchers alike will find themselves dismayed by the inconvenient and even arbitrary manner in which the compilers chose to order the prints in the main body and tables. And as they discover its numerous errors and oversights, researchers will shudder at the substandard scholarship in the introduction and other explanatory materials, and at the poor design and sloppy editing of the tables in the back. All of the prints in the main TNS and YHS series of news nishikie were published between the falls of 1874 and 1875 -- spanning barely one year, coming just six years after the start of the Meiji era in the fall of 1868. A few associated prints were produced toward the end of 1876 in response to civil disturbances that, as it turned out, triggered the Seinan War of 1877. The prints are represented as being "of" or somewhat related to the "civilization and enlightenment" -- a slogan which defines the Meiji period. This is true mostly in the trivial sense that all were published during the period, which continued until 1912. Thematically, though, the TNS and YHS prints are more definitive of the human condition without respect to time -- or, for that matter, place. The subtitle promises "all works" -- but two well-known prints -- YHS-832 about a whale caught off the coast of Shimofusa, and YHS-1155 about a fire in Sukiyacho -- are missing. YHS-832 is listed in Tsuchiya 1995 (which notes that the print was mentioned by Miyatake Gaikotsu), and both YHS-832 (by number) and YHS-1155 (not by number) are listed (but not included as images) on Tsuchiya 2000 (Bunsei Shoin CD-ROM). 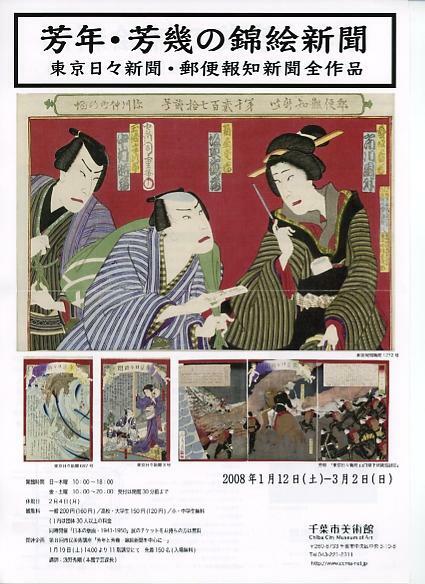 The compilers of CCMA 2008 claim to be familiar with Tsuchiya 1995 and 2000, yet they make no reference to these prints in the exhibition catalog. Furthermore, the Philadelphia Museum of Art has copies of both prints. Both were shown at a Yoshitoshi exhibition that traveled in Europe and the United States in 1992 and 1993. And images of both were published in the exhibition catalog -- which is well-known in Japan. Not to mention that copies of both prints were known to exist in Japan. See YHS known prints and Sukiyacho fire for an image of YHS-1155 and a summary of its story. See Shimofusa whale for an image of YHS-832 and a summary of its story. The table of YHS prints in the back of the book claim that Nos. 614b and 1272 are "not mentioned / recorded / listed" (記載なし kisai nashi) on Tsuchiya 2000. The exhibition flyer shows both -- No. 1272 most prominently -- and CCMA's website boasted that these two prints were "new discoveries" (新発見 shinhakken). However, both 614a and 614b are listed and described in Keyes 1982 and van den Ing and Schaap 1992. Both are also listed and described in Tsuchiya 1995. Only 614a is listed on Tsuchiya 2000 -- but its listing as 614a (rather than just 614) makes it clear that the failure to list 614b was a compilation error. See Tokyo officers nab armed robber for a scan of the copy of YHS-614b in Yosha Bunko. YHS-1272 is a known print -- or, more precisely, a known kabuki flyer. It has not been listed elsewhere because it is totally unrelated to the YHS nishikie series -- and the attention it got at the CCMA exhibition was totally unwarranted. See Dramatizations of news for an examination of YHS-1272 and other "drama news" flyers, as well an example of a true drama-related news nishikie. Practically all of the TNS and YHS prints have a unique number that corresponds to the issue of the newspaper in which the story shown on the print first appeared. Though not all issues are represented, the numbers still run serially -- 1, 3, 50 . . . 1060 for TNS, and 425, 425, 447 . . . 1155 for YHS. Since "50" in the TNS series is actually an error for "48" it can be listed as "50 ". Since two prints in the YHS series are numbered 425, they can be called "425a" and "425b" -- and there may be good, non-arbitrary reasons for prefering one rank order to another. The the order -- or disorder -- preferred by the compilers of CCMA 2008 defies all common sense. I cannot imagine a more inconvenient way to present the prints in a book of this kind. Almost any other order would have been better. The compilers of CCMA 2008 simply ignored the excellent models of presentation seen in Ono 1972 and Tsuchiya 2000, and the very clean, logical, and efficient organization of the tables in both Tsuchiya 1995 and 2000. Ono 1972 presents the TNS and YHS prints in the Ono Collection in order of their issue. The back matter, consisting of text and commentary, is similary ordered. A reader never needs to consult a complicated table to find the image or the text of a print of a particular issue number. A reseacher or collector who wants to examine an image or text for a particular issue simply thumbs the book as you would a dictionary. Any print -- and text -- can be found in seconds. Tsuchiya 1995 -- somewhat like Takahashi 1986 (1992) -- groups selected Osaka prints (with a few related TNS or YHS prints) -- according to theme. The tables in the back, however, summarize the particulars of all known prints in all major series, beginning with TNS and YHS. Since practically all prints have issue numbers, the issue number -- expressed in Arabic script -- becomes the index key. An entry in the TNS table begins, say, 1036b, followed by a its particulars, and a one-phrase summary of the content of the story. 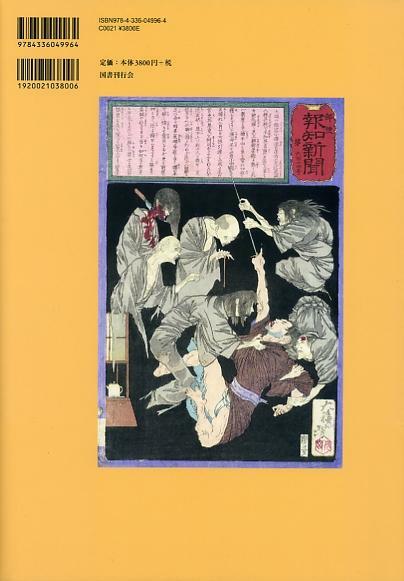 Tsuchiya 2000 -- the Bunsei Shoin "Nihon nishikie shinbun shusei" CD-ROM -- has a few minor errors but, on the whole, is a truly useful and reliable research tool. The main image lists are ordered by issue number. Tables of particulars are also ordered by issue number. There are other lists by publisher, drawer, carver, writer, theme, seal date, et cetera. The image and data files are cleanly and clearly organized according to the very logical scheme of the tables in Tsuchiya 1995. The names of all files related to a print series begin with the initials of the romanized title of the print series, and continue with the issue number of the print -- hence TNN#### (where I use TNS-####) and YHC#### (where I use YHS-####). It would have made supreme sense to adopt Ono's linear presentation in the body of the CCMA book, and Tsuchiya's generic numbering scheme in both the body and the tables of particulars (about which more later). But the compilers of the CCMA book were too clever for their own good. The people who mounted the exhibition decided to run the prints along the walls of primarily in order of the dates of their approval seals or notification stamps. Prints which lack such dates are grouped together after those which have them. Since each of the two series of prints are divided into two sections -- prints with, and prints without, publishing dates -- there are four larger groupings of prints. Within these broad groupings, though, are other convolutions of disorder. Imagine a dictionary in which words are listed -- not in ABC order -- but in chronological order of their coinage. In other words, to find a word directly, you have to know when it was first used. Now imagine you know a word's coinage date. But there are no index dates in the corners of the pages. Page runners begin with the word, and the coinage date follows the word. So you have to flip through each page and keep you eye on the dates following the words. Words with the same coinage date are grouped together -- but the words within each date group are not necessarily listed in ABC order. Words with no coinage dates are grouped separately -- in roughly ABC order -- after words with coinage dates. And words with the same spelling and same coinage date (or lack of a coinage date) are listed according to the ABC order of their definitions. If you want to go directly to the page on which a word is found, you have to consult an ABC-ordered table in the back of the dictionary. To use this table, you first have to find the word in the extreme left column. Then you have to scan the columns of particulars about the word -- all the way to last column on the extreme right of the page. Here, finally, if your eyes have remained in the same row, you will see the number of the page on which you will find an image of the print and a text of its story. If, however, two words have the same spelling, you may have to check two page numbers before you find the word you are looking for. Because the table does not include a clear, unequivocal description of the word. To make life more interesting -- a word with no coinage date may be grouped with words with a coinage date. Moreover, some coinage dates may be wrong -- and some words may be mispelled. Say you have a TNS print numbered 1050 and a NTS print numbered 1052. The table in the back of CCMA 2008 does not list 1050. But it slists 1052a on page 129 in the section without seals, and 1052b on page 71 in the section with seals. On page 71 is a print called 1052b -- and the number on the print is 1052. On page 129 is a print called 1052a -- but the number on the print is clearly 1050. The guide sheet distributed at the exhibition lists 1050 and 1052 -- which accords with all earlier sources. You have two TNS prints -- different images, different stories -- both numbered 919. Neither has a seal, so both should be together in the section for prints without seals. You find 919a on page 112 in the section -- but no 919b. So you check the index. The "Publication year-month (Meiji)" column of 919a has "None" (なし nashi) as expected. But the same column of 919b says "8th year" -- meaning Meiji 8, i.e., 1875. The print is on page 52, in the section for prints with seals. But seals are identified by year and month. Why, for only this print, was no month given? Page 52 is the first page in the section for TNS prints with Meiji 8 seals. But clearly there is no seal on 199b. The margin states that the print was published "during Meiji 8" and the source article was published on "Meiji 8-1-28" (28 January 1875). 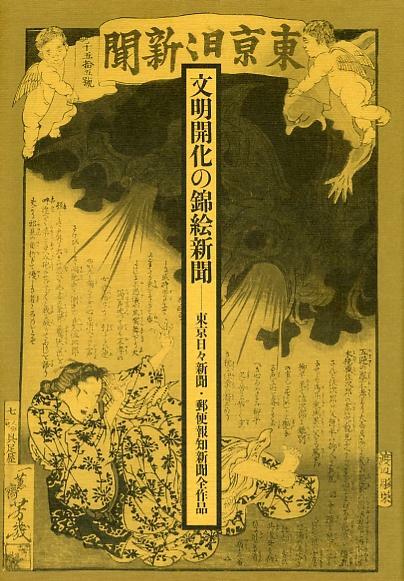 The explanation beside the image, however, states that "From the fact that both the text [on the print] and the cited paper have 'last year, 12th month, 20th day' it can be conjectured that [the print] is a Meiji 8 publication." If the source newspaper was not published until 28 January 1875, the nishikie story could not have been published before this date -- regardless of the dates in the story. This logic also applies to 919a -- and to all nishikie which lack seals but have stories based on datable sources. So why the exceptional treatment of 919b? Immediately following 919b -- which has no seal -- are prints with Meiji 8 seals, grouped by month. Five Meiji 8-1 prints -- 900 , 913b, 914, 911a , 917b. Three Meiji 8-2 prints -- 940b, 944, 911b. Four Meiji 8-3 prints -- 940a, 969, 926b, 913a. Six Meiji 8-4 prints -- 964, 975, 978, 981, 982, 992 -- et cetera. Why the disorder in issue numbers? The real problem, though, is that some publishers -- most obviously Gusokuya -- used seals very erratically. In other words, the presence of a seal on a print is no assurance that it was published during the year and month represented by the seal. On page 51, immediately before 919b, is number 892 -- the last print with a Meiji 7-12 (December 1874) seal. Issue 892 of the source newspaper was published on Meiji 7-12-29 (29 December 1874). Does this mean that Gusokuya published TNS-892 during the last two or so days of the year? In any case, the 892 print shown in CCMA 2008 is clearly a later Tsujibun re-issue. CCMA 2008 makes a number of claims about 東亰 which are not true. It describes the calligraphy on the banner of what I have called a Stage 1 banner as resembling that of the newspaper (page 79). Not only is there no resemblance, but the newspaper masthead used 東亰 -- not 東京 -- for the name of the city (Newspark 2001). CCMA 2008 draws attention to the use of 東亰 on the banner of what I have called Stage 3, and notes that "from 2 December 1874 (Wednesday" the paper became 東亰日々新聞" (page 79). While a fascimile of page one of Issue No. 985 (14 April 1875) shows 東京日々新聞 in the body of the paper, the banner remains 東亰日日新聞 (Newspark 2001:109). And -- indicative of CCMA's lack of attention to detail -- the calligraphy of the Stage 3 TNS banners is almost exactly the same as that of the newspaper. For a more accurate analysis of "Tokyo" and "Tokei" see TNS two series, four stages and review of Ogi Shinzo's Tokei jidai. According to the guide sheet distributed at the exhibition showing the information on prints in the order of their presentation, and according to the the table in the back of the book, all prints exhibited, and all prints shown in the books, all prints in the main TNS series are Gusokuya editions. Both the guide sheet and the table indicate that nine (9) of the TNS prints also have Tsujibun editions. The explanation next to the image of each of these nine prints in the book ends with the remark that "There is also a 'Tsujibun' edition work." One such print is TNS 892 (page 51), the last print in the section for TNS prints with Meiji 7 (1874) seals. However, the image of this print clearly shows that it is a Tsujibun -- not a Gusokuya -- edition. 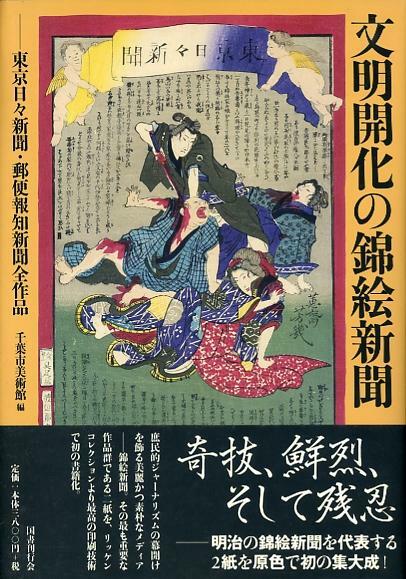 It is the only such example of a Tsujibun edition in the entire book. I cannot remember whether the print shown in the exhibit was a Gusokuya or Tsujibun edition. Now things get tricky. The original of TNS-851 was reissued with a different text. The cartouche which had also revealed the name of the story's protagonist was conspicuously missing -- that is, the reissue shows traces of where the cartouche had been. The table in the back of Tsuchiya 1995 does not list the two versions separately. However, the table on Tschiya 2000 appropriately labels the original "851号" (No. 851) and the revision "851号異版" (No. 851, different edition). And the image and data files for these two versions are named respectively "TNN0851" and "TNN085D" -- the "D" reflecting 異版 (ihan) or "different edition". My own designations are "TNS-851o" and "TNS-851r" -- reflecting my nomenclature for differentiating "original" and "revised" editions of prints with partly recarved variations. In the CCMA exhibition, the revision of TNS-0851 is shown after the original -- which makes sense. In the main body of the CCMA book, too, the original is shown first (page 98) and the revision is shown next (page 99). However, the table (page 207) lists them in precisely the reverse order -- the "later edition" (後版 atohan) comes first and is called 八百五十一号ｂ (851b), while the "first edition" (初版 shohan) comes second and is called 八百五十一号ａ (851a). Why this odd labeling? Because TNS-851 has no seal. And the CCMA rule for ordering prints which have the same number is determined by the gojūon (50-sound) order of the text on the print. Revised TNS-851r becames "a" because it begins "Aki atuki niwamose hakite uchi mizu ni" -- whereas original TNS-851o becomes "b" because it begins "Tokyo Ogawamachi ni sumeru Kobayashi sore ga shi wa". It was Kobayashi's name and address, among other personal information his bereaved family objected to being publicized, that Gusokuya was apparently pressured to expunge from the original edition. There are other numerous anomalies. Two TNS prints bear the issue number 856. One has a seal. The other has no seal. According to CCMA's ordering rules, the print with the seal has to come first. There is a slight complication. The source of the story on the print with the seal is issue No. 858 of the newspaper, which was published on Meiji 7-11-22 (22 November 1874) -- three days later than No. 856. But rules are rules. In the table, 856  with a seal comes before 856 without a seal. The reader who wishes to examine the two prints is referred to respectively page 47 (八百五十六号ａ) and page 100 (八百五十六号ｂ). However, the two prints have the same type of cherub and banner design. According to the very crude, partly incorrect examination of different designs on page 79, they would have been published about the same time. By segregating prints according to whether they bear an approval seal or notification stamp, and featuring first those that do, the compilers have placed more emphasis such prints. Why they prefer to impose this arbitrary order on the prints is not clear. I say arbitrary because (1) while knowning the approximate date a print appeared may be of interest to some historians, it is far from clear why a reseacher or collector would want to veiw prints with seals before viewing prints without seals, (2) there is, in any case, no assurance that a print with a seal was published at the time the seal was obtained, (3) and, in the end, within a subset defined by the same nominal seal date, prints are sorted by issue number. The futility of ordering the prints by seal date is underscored by the the way the compilers bungle their assessment of prints with seals that correspond to 明治7年10月 (Meiji 7th year 10th month) or 1874-10. They lump together 19 such prints in the TNS series (page 6, Table 1). The compilers make use of a blank page -- which falls between all the single-sheet TNS prints with seals and a group of TNS triptychs -- to draw attention to, and comment on, the variety of title cartouche designs on the TNS prints. They show four types of cherub and banner designs and make a number of misleading statements. The most problematic remark concerns the second design, which I have been calling "Stage 2" (see both Four stages and Cherubs and Banners). Here is the entire comment (page 79). [The above design is used] From works of 1874-10. This month is the most active [peak] period of the nishikie edition "Tokyo nichinichi shinbun". The "dog 10" (｢戌｣ inu, jutsu) approval seal (改印 aratamein), indicating the year and month of publication, is impressed in the title. In fact, the 19 prints the compilers attribute to 1874-10 bear two kinds of 戌十 (dog 10) seals. Seven (7) have a "manji" (卍) seal and twelve (12) have a "rotated ju" (Ｘ) seal. All seven "manji" seals appear in prints with a Stage 1 style banner. None of these, however, appear on the banner with the title. Ten of the twelve "rotated ju" seals appear in prints with a Stage 2 banner -- eight of which (all but two) are impressed on the banner immediately below the center of the title. The other two "rotated ju" seals appear on Stage 1 style banners, and one of these appears on the banner with the title. This book is clearly a rush job -- done quickly, without giving sufficient thought to what most matters to serious students of such prints as artifacts of social and/or art history: (1) ease of use and (2) accuracy. As publishers, they failed to recognize the merits of the simple and elegant ordering of the TNS and YHS plates in Ono 1972, and the similar serial organization and naming of the images and related data on Tsuchiya 2000. As scholars, they failed to incorporate the valuable information contained in Ono 1972, and Tsuchiya 1995 and 2000, among several other available sources, this website included. In other words, CCMA 2008 -- while beautiful on the surface -- is a step backward in understanding the two most important news nishikie series. 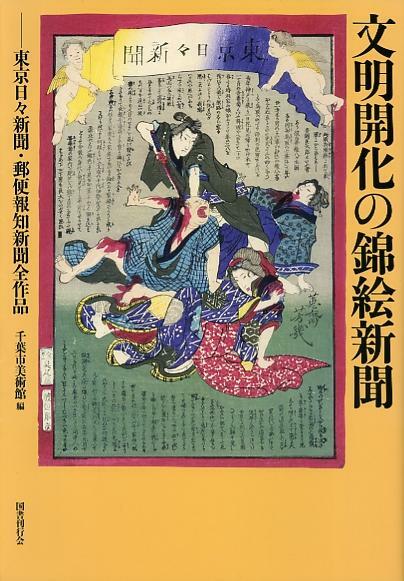 The only person who truly deserves credit for a job well done is the owner of the Rikken Collection, who consigned his work to the Chiba City Museum of Art on the condition that it publish a book showing -- for the first time -- all prints. He remains anonymous, as he had nothing to do with the mounting of the exhibition itself, nor with the compilation of the book. I know the collector. Our paths crossed as the result of a TNS print listed in the catalog of a certain ukiyoe shop in Kanda. The collector did not have a copy of the print as numbered in the catalog. He had a print of the same design but with a different number. So he wanted to confirm the particulars of the print in the catalog. The print, however, had been sold, and the shop could not recall the particulars. So he asked the shop if it had a record of who had purchased the print. It did, and agreed to convey his message. When the shop called, I gave it permission to give the collector my phone number. When he called, I told him my story. I had bought the print -- the second or third of my acquistions -- knowing the number in the catalog was wrong. I had penciled the discrepancy on a copy of the page in the catalog, and on the tag and receipt that came with the purchase. I faxed him my records, which confirmed that my copy of the print was like the one he already had. We swapped quite a bit of information about the prints in our respective collections. He has amassed over ten times the number of prints in my paultry collection, over ten times the space of time. So while he may have learned a few things from me, concerning the sort of details that I have studied, I have been the greater beneficiary of the exchange in terms of sheer information about the world of Meiji prints, collectors, dealers, and museum politics. We met in person for the first in May 2007 -- at Chiba City Museum of Art. After lunching together, he introduced me to Asano Shugo, the currator of the museum, and the person mainly responsible for the compilation and editing of CCMA 2008. Asano is an expert on Hishikawa Moronobu among other Edo ukiyoe artists. He rubs elbows with ukiyoe experts like Chris Uhlenbeck, at international ukiyoe conferences, held in Europe and at his own museum. Asano and I exhanged business cards, and he was made aware of the existence of the News Nishikie website and of the Andon 80 article. I also expressed my willingness to assist in the writing or editing of English titles or other such content that might benefit the planned TNS and YHS nishikie exhibition. I never heard from Asano. The collector, though, kept me abreast of developments in the planning of the exhibition. Each phone call brought another report of an aspect of the exhibition that would differ from his anticipations. The museum would make up prints he lacked by borrowing them from institutional collections -- not from other individual collectors. Some of the prints would be shown as prints of scanned images because the museum was unable to find a copy in an institutional collection. The originals of some of the prints that were to be borrowed from institutions might have to be returned before the end of the exhibit -- in which case they, too, would be replaced by prints of scans. I attended the exhibit during its first week. The prints were mounted without descriptive titles. Beside each print was a tag with the name of the series, the issue number, the name of the loaning institution if not from the Rikken Collection, and other such particulars -- but no titles. The collector called me the following week to inform me that this had caused a huge problem, as some vistors complained about the lack to titles. The museum staff was forced to burn some midnight oil to make descriptive titles. But the prints now had titles. This explained why there were no titles in the book -- neither on the pages showing the images and texts, nor in the table of information at the back. The people responsible for mountaing the exhibition -- the complilers of CCMA 2008 -- had never thought of -- or had thought of but nixed the idea of -- descriptive titles. The collector appologized for the organization of the book before I could ask him about it. I had already noticed that his name was not in it. He said he had nothing to do with it it -- except, late in the editing process, he happened to see a draft of the table in the back -- and told the editors that they needed add a page number so that readers could use the table as an index to the prints -- otherwise there would be no way to find prints. Apparently Tomizawa would have run the prints in the most logical and useful way -- by issue number -- more or less following Tsuchiya's tables and nomenclature. Apparently Asano insisted on the ordering rules gave priority to seal dates. Apparently no one at the museum was an expert on Meiji prints. Apparently Asano -- who heads the Ukiyoe Association of Japan, and overseas the publication of its journal -- was accustomed to publishing catalogs showing prints in chronological order. Never mind that the vast majority of ukiyoe were not published with issue numbers.